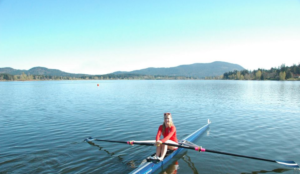 Maple Bay Rowing Club will be hosting the fourth in the Friday Night Challenge Series at Quamichan Lake in Duncan. 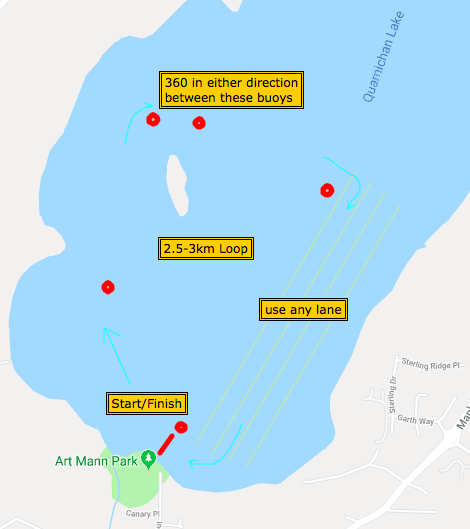 Maple Bay’s course features a creative 500m loop from shore around an island and back. Come check out the venue from the 2018 BC Summer Games and enjoy Quamichan’s flat water and beautiful scenery. Participants should arrive at 5:00pm and be ready for a pre-race meeting at 5:30pm. Racing will begin at 6:15pm will a BBQ to follow. The cost of the BBQ is included in the registration fee. There will be limited boat rentals available for participants who cannot bring their own equipment. Please contact Dave Symonds at davesymonds@shaw.ca for information about boat rentals. Registration is available here. All participants must be members of Rowing BC and Rowing Canada Aviron. Even if Quamichan Lake is not in your neighbourhood, we encourage you to attend! From the Lower Mainland, take the 1:15pm ferry from Horseshoe Bay to Departure Bay. Quamichan Lake is approximately a 45-minute drive from Departure Bay. The event will take place at Art Mann Park, located at 5990 Indian Rd in Duncan. There is a parking lot next to the boathouse with free parking. While you’re at Quamichan lake, head over to Maple Bay’s Boathouse on the ocean nearby to check out the beautiful view over to Saltspring Island. Nearby in Duncan, Canada’s only tea farm, Westholme Tea Farm is open for tours and tasting. The Cowichan Valley is also home to some of BC’s best wineries!